1. Go to Avik and hang out at the nav beacon, whacking Wanted NPCs. They're almost all really easy NPCs so it's not exciting, but, eventually,I get allied with Sirius Corp.
2. Do the Chakpa/Ochosi run a whole bunch; sure, I'm getting Federation rep and plenty of money, but it's not that exciting. I'm doing it to get Modular Terminals. I finally get 25. 3. Fly to Sirius, dock at Patterson. No invite mission from Marco Qwent. Re-log a few times, still no mission. 4. Run other missions, go back to Patterson. No invite. 5. Fly to the outpost in the system, no invite. 6. Work from home this morning; fire up ED and do nothing but mode switch for an hour and a half, just to see if the mission shows. It doesn't. I have literally checked the boards in probably 40-50 separate instances since last night with the visits and mode switching. Marco Qwent can eat a giant pile of space dicks. There's an open bug report on the Frontier forums for this, but, man, this is annoying. I mean, I can't really go do a whole lot else, as it's kind of a pain to get the Modular Terminals, and I don't want to dump them.. I'm really wishing I hadn't just been selling modular terminals when I got them. I had a feeling I'd need them later. Should I sign up for a faction? Is there any point doing it until I have a decent ship under me? Is there even any point doing it if I'm playing on a private shard? If you haul around Modular Terminals (or any other cargo, it reduces your capacity, plus you get interdicted more often. Sell them, they're not that hard to get, and unlocking Poopyface McQwent Stupidhead (I AM A MATURE ADULT) is way down the road. Factions won't matter a whole lot, but might as well join one. As you level with a faction, you get two things; access to permit-only systems, and the opportunity to buy rank-locked shops from that faction. So, why not? Imperials have some really fast ships, the Federals have some ships with impressive firepower, so pick one that sounds good and go. Really not much of a downside to it. Except Alliance, which gets you nothing at all for joining, so . . . why? Righto. Felicia Winters it is. You'll definitely want to buddy up to the two major factions, Fed and Imperial rep unlocks some neat ships further down the line and gaining faction ranks is also required for some of the engineers. Alliance faction rep doesn't give anything but IIRC all the work you do for independent systems counts for alliance rep, even if is not an alliance faction. You also have a rating that decays down to 75% over time, if you get it to 100% you become "allied" which AFAIK does nothing except make the police show up a bit faster if you get into trouble. Don't worry about it, unlocking Qwent to the point where you can actually hand him the modular terminals is such a long process that holding onto them ahead of time is a bad idea. Just work on getting him unlocked and then gather the terminals while working towards other engineers. But you should definitely work towards Qwent asap because he leads to Professor Palin and dirty tuned engine mods, which are a game changer. Also if you see a mission that rewards exquisite focus crystals, take it right away. They are possibly the rarest material in the game and only come from missions, so finding one is like finding a unicorn. Don't have time to type a full explanation, but it's worth pointing out that powers and factions/super powers, while related in fiction, are different, unconnected gameplay concepts. You do missions for factions, and gain reputation with them. Reaching higher reputation levels with factions gives you access to better missions from them, and sometimes will give you a permit to visit locked star systems at specific reputation levels, or give you an invite to visit an engineer. The most notable and notorious of these is the Sirius Corporation, since gaining Allied reputation with them is a major roadblock in progression with engineers. There are only a handful of ranks to faction reputation (i.e., Neutral, Cordial, Friendly, Allied, and a few negative ones that I can't recall off the top of my head), and it generally doesn't take long to max out. If a faction is associated with a super power (the Federation, Empire, or Alliance) you will also gain reputation with them. Ranking up with the Federation and Empire unlocks access to ships, as well as permits and certain engineer invites. You can freely work for competing factions and super powers all you want without any consequences -- there is no "joining" a faction or super power, only doing missions for them. Powers are part of a completely unrelated political power struggle meta-game ("Power Play") that's far to complex to explain here. Many powers are associated with one super power or another (and there is a Sirius Corporation power that is fictionally related to the Sirius Corporation faction), but working within the Power Play system has no effect on your faction/super power reputations and ranks, and vice versa. If you participate in the Power Play system, you can gain access to power specific weapons and equipment. Some are quite useful or fun, but mostly they are just slightly tweaked versions of regularly available equipment. You DO have to join a power to participate in that system, and when actively engaging in power play you will encounter ships (NPC and potentially player) associated with rival powers that will be hostile towards you. - Work for Empire and/or Federation associated factions when you get the opportunity, because sooner or later you'll probably want to try out one of their ships. - Work for the Sirius Corporation faction when you get the opportunity, because sooner or later you'll want to unlock the engineers that are gated behind that faction. - Eventually there are a few other factions you might want to specifically work for for engineers, but they're probably not worth worrying about upfront. - There's no harm in joining a power (at least, not any more) but I don't particularly recommend worrying about interacting with the Power Play system early on. It doesn't offer anything helpful for a a new player. The only thing to really be aware of is that if you go to systems owned by Li Yong Rui (the Sirius Corporation power) you'll get a 15% discount on ships and parts regardless of whether or not you are pledged to any specific power. Li Yong has his headquarters in Lembava but I prefer to park all of my ships in Diaguandri because the selection of things for sale seems to be better. The 15% discount is fantastic, even better than the one in the founder's system. The last patch changed the powerplay mechanics so that NPCs of another faction will no longer hassle you unless you are actively engaged in powerplay activities, so there is no real downside to pledging to a power. All this talk of Sirius wall is foreign to me. I probably spent all of 2-3 hours max doing actual Sirius activity, got allied and got my permit. I've been playing a while, so maybe I did Sirius stuff before it was cool to do so, but I didn't run into any problems or challenges getting the actual permit. I don't think I did more than 5 or 6 simple delivery missions and I may have turned in like 500k of bounties from one of the nearby systems. Got the notice I was allied.. flew to the system that hands out permits (with the base 10k LS from star), and there it was... done. Did I just get extremely lucky or is 2 hours of missions considered "Grindy" now? Getting the permit to get into Sirius was easy; it's getting the specific mission in Sirius to be able to go to Marco Qwent's base that's the issue. Both the system permit and terminals were pretty easy, but I just can't get the engineer unlock itself to pop. Ah.. I see I've never actually been into sirius after getting the permit. I know I need the terminals, but since I haven't bothered with that yet haven't really tried. Yeah, the reputation required is easy. The hard part is the mission board because sometimes it just utterly refuses to give out the mission you need. And since only one specific faction can give the permit or invite you are even more at the mercy of the RNG. It can take hours, even with mode switching. For whatever reason, it actually did take me quite a while to get the rep I needed. - It's easy to accidentally get rep with them since they are in so many systems. - I might have pissed them off by abandoning missions out at Sothis ages ago? I'm not sure, but I could have started out in a bit of a hole. - Mission availability and/or rep rewards might have been sh*ttier when I was trying to do it (just after the 2.1) patch. More recently (after 2.2) I've had a much easier time getting allied with other factions. So, I dunno, it may have taken me in the three to five hour range? Hard to say, but for whatever reason, it felt like a slog. And then it took docking a a few different stations to get the permit, and a few more to get the invite to Qwent, and then Modular Terminals were a lot harder to get at that point -- several balance passes have happened since then. Anyway, it's good to hear it's less of a pain than it used to be, but I suspect it's still one of the bigger grinds in the engineering progression, right? Another possible reason is that Sirius Corp used to own a lot more ground. Outside of Sothis and Ceos and the Sirius system (which you can't get to initially) the only stations they operate in are in Procyon. Procyon is bad for missions because all of the stations are better than 10k light seconds away from the jump in point. On top of this, when I was trying to get Sirius rep they didn't have overall control of any of the systems, so handing in bounties and the like wouldn't increase rep with them. This forced me to do missions out of Sothis, but I made a decent profit with the long distance hauling missions so it wasn't so bad. Managed to get a bunch of missions that paid about 5 million to haul just 7 tons of sh*t back to the bubble. Dunno why they wanted Sothis biowaste so badly but it apparently increased the chances of an outbreak in the systems I delivered to. Avik has a Sirius Corp station as well. At least, they used to. 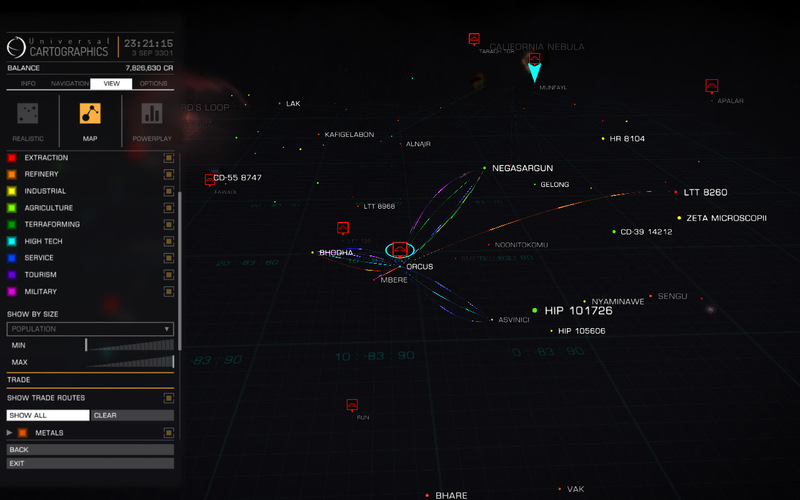 I got my Sirius rep in Avik by bounty hunting at the Nav point. Not super fast, but it worked. I logged on again tonight while doing other things in my office and mode switched for another hour; no mission. Just sold my Modular Terminals and went on to do other things. I don't think it was delayed to add the planets? They won't even be in the first beta of 2.3, but most likely the second wave. Hey, with the beta coming out, I'm gonna be jumping back in likely this weekend. Anyone have a quick rundown on how Veloxi's Vixens are doing, and what, if anything, it needs for further expansion? Thanks for the great tip on the pirate base - very target rich, I made 3.5 million in about an hour too. Looks like this CG might pay quite well and will be ideal for levelling up my fighter pilot (currently ranked expert). Hey, with the beta coming out, I'm gonna be jumping back in likely this weekend. Anyone have a quick rundown on how Veloxi's Vixens are doing, and what, if anything, it needs for further expansion?! Last I checked Veloxi's Vixens had expanded from Orcus into both Negasargun and Asvinici - I think Asvinici was the most recent and probably where influence still needs to be raised. Asvinici Crimson Posse still have control of the Coriolis in that system. Veloxi owns the station in Negasargun now, which is helping out Denton Patreus as that guy mentioned a while back. Other than that I haven't been back to check on Orcus in a while, busy with engineering stuff. It's the most fun I've ever had bounty hunting; I've taken to only attacking things pretty much AspX and above, and leaving the little ships. They're too fast to track effectively in my Python, and they do such a great job of swarming the bigger ships that they're just handy to have around. An Anaconda jumped in last night at one point when I was playing, and it was immediately swarmed by six little ships. It was pretty hilarious to watch. Okay I finished analyzing the data for shields. Skip to the end for the TLDR. 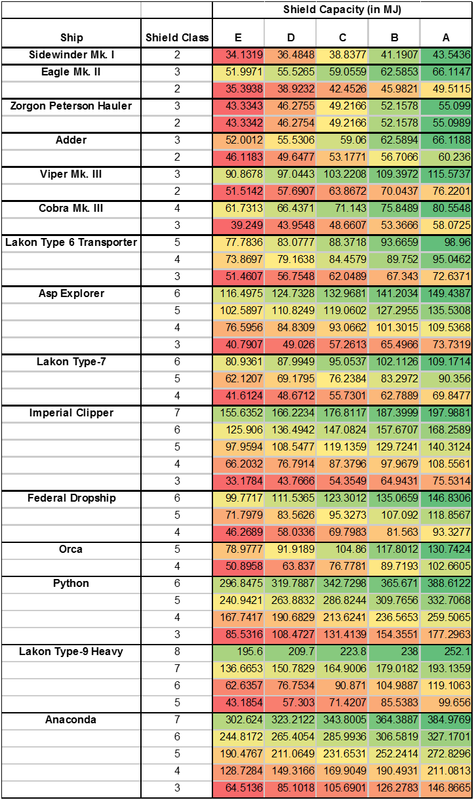 This list is composed of each ship in Elite listed by maximum shield size and ordered by shield strength. The first number is hull strength and the second is shield strength using the largest A grade shield available. A couple things are immediately evident, shield strength varies dramatically by ship type. Changing the weight of your ship using mounted equipment doesn't have any effect on shield strength because you are not changing the outer shape of the hull. Each ship has a hidden multiplier based on how "hard" it is for your shield generator to form a bubble around it vs the rated optimal mass of a shield generator. An Imperial Cutter using an 8A shield loses 25% capacity downgrading to 7A, a 6A shield loses a further 40% compared to a 7A. I'm not going to list each ship as the numbers vary dramatically, but generally speaking each step size level below the maximum imposes a 15-40% loss of shield strength compared to the previous one. Ships can generally mount shields 2-4 sizes smaller than the maximum before they exceed the maximum rating. On a side note the only ship on this list with stronger shields than hull is the Imperial Courier. For combat use you will obviously want to use the biggest shield available but there is an argument for weight vs performance. D-class shields of the same size generally lose 20% in shield strength, but weigh 60% less and use 40% less power. However D-class also have only HALF of the structural integrity of an A class, and so are damaged and destroyed that much easier, despite this I would still say that D-class shields are perfectly viable for PVE. Prismatic shields are an alternate choice, compared to A class shields of the same size they offer about 15% more shield strength, but at a cost of DOUBLE the weight and 33% more power draw. They also regenerate about 50% slower and take twice as long to reboot after being knocked out. Despite the increase in weight they have the same structural integrity as regular shields. Prismatic shields are obviously slanted towards extreme shield tanking where you plan to never let your shield go down at all, and max out on shield cells instead of using hull reinforcements. The extreme weight makes them awkward to use for anything other than combat. Bi-Weave shields provide 20% less protection and draw 30% less power, they weigh the same as class A shields but lose about 15% of structural integrity. The main draw of biweave is that they regenerate very quickly, twice as fast as regular shields and four times faster than prismatic. They also rebuild to 50% in half the time of regular shields when broken. Hence biweave shields are the best in situations where you plan to stay a while and have no/limited shield cells. They are the only kind of shields that are practical to raise again if you lose them in a fight as most combat is over too quickly for it to matter. For "every day" use D-class shields of the highest size are the most efficient form of protection as even a D class is stronger than an A class of the next smaller size. For "attrition" combat where many fights are strung over a period of time such as in a RES or CZ, Biweave shields are clearly superior. For very short but high intensity fights with lots of shield cells and heatsinks as backup, prismatic are the best choice. But honestly the plain old A grade shield works perfectly fine, which type of shield you pick is going to depend on the build you're planning to make. In my case for PVE combat I'm tending towards biweave shields because I only plan to have a single shield cell (the biggest I can mount) backed up with hull mods that let me tank damage for the short period of time it takes my biweave to reboot. Since all three types of shield share the same pattern for damage resistance it's much easier to figure out which engineering mod is better for certain tasks. Thermal resistance is obviously the superior option, it has high resistances across the board and like thermal reactive armour it does not have a weakness to any damage type. Thermal damage is probably the most common damage type, lasers are ubiquitous and have many advantages compared to projectile weapons, even "silly" builds with all-cannon/multicannon/fragment loadouts rely on incendiary rounds to convert some of that kinetic to thermal damage. I don't think much more needs to be said, however I might as well mention the other mods and why you would want to use them. The kinetic resistance mod does the same thing as the thermal resistance, in this case raising kinetic protection by 30% at the cost of 9.6% thermal compared to raising thermal protection by 60% at the cost of 4.8%. Both of these mods can also increase the structural integrity of the shield generator by 40%. Now the benefits of thermal protection are obvious but I can also see one use case for kinetic protection. Back before we had engineering mods it was common for players to explore outside the bubble without shields. The weight savings increased jump range and the lack of protection was meaningless because there are no threats. However with the release of horizons we now have the ability to land on planets which an explorer would want to do for various reasons. Landing can be dangerous for exploration ships, particularly on high gravity planets because they almost always have small D rated engines. To cushion landings it can be wise to bring along a shield generator because simply touching the ground even with landing gear out will damage your ship. The added weight is negligible when you factor in modded FSD ranges and you can easily have a shield and still jump 40-50LY. Since impact damage is kinetic using a kinetic resistance mod will have a greater effect than simply raising your pool of shield points. The smallest shield you can fit on an Anaconda is a 3D which weighs a mere 2 tons, with a kinetic mod it can protect you from 467 kinetic damage, which is almost half of your base hitpoints and more than enough for any landing accident short of a high speed lawn dart. The other two available mods are Enhanced Low Power and Reinforced. The enhanced shield mod decreases integrity by 25% but also lowers mass and power draw by 40%. It also tweaks the optimum mass and multiplier slightly but this only amounts to an increase of 5% in shield strength. Reinforced increases the optimal mass by 30% and increases resistances by 9/18/7.5, however despite the name it does not increase integrity and also lowers regeneration rates by a few percent. Reinforced does have obvious merits but I consider Enhanced Low Power to be entirely pointless, I can't think of a single use case where it would be superior to other options. A reinforced D-class shield is stronger, weighs 33% less and consumes slightly less power than an enhanced A grade shield. If you mount the biggest D-class you can and mod it with Enhanced to make it even lighter you gain the best weight-protection ratio, but if you are putting a shield in the biggest slot possible then weight is the least of your concerns and you might as well maximize protection. At the opposite end of the spectrum where you are mounting the smallest D class shield possible, making it even lighter only grants you about .1LY of extra range and you might as well use kinetic resistance instead for the reasons I described above. When plotted out the data looks exactly like you would expect, but this doesn't tell the whole story because we have yet to factor in shield boosters. The first number is base shield strength, the next three numbers are effective strength against kinetic/thermal/explosive damage after resistances are applied. Shield boosters are much simpler than hull reinforcements because they only offer a % increase to base shield points from 4 to 20% at the cost of .5-3.5 tons of weight. A-grade shield cells draw a huge amount of power at 1.2 megawatts each, that's more than a size 3 pulse laser and almost as much as a railgun. Shield boosters have three types of mods. Specific resistance mods increase one resistance by 24% and subtract 4% from the other two types for a net gain of 17% at no power or mass increase. The all-resistance mod increases all damage resistances by 12.5% each at the cost of 17% integrity and 35% more power draw. The final mod and the one that likely gets used most often is the Heavy Duty mod which increases shield boosting by up to 180% and adds 15% integrity, the downside is the 20% extra power draw and the whopping 250% increase in weight which can make a A class booster weigh more than 12 tons. So the two main questions I'm trying to answer is if the use of boosters can make one shield mod better than another and how soon the diminishing returns kick in. Lets look at diminishing returns first, each shield booster adds 12.5% which conveniently is a divisor of 25, 50 and 100. For simplicity all percentages are rounded. Interestingly it seems like resistance boosts to low or negative stats actually have increasing returns, but as expected past 50% efficiency drops dramatically. Now unlike hull reinforcements you can only get resistances or shield strength, not both. So it's important to find the optimal ratio. The first number listed here is the base shield strength of a thermal 8A shield, the following three are the effective strengths after resistance, the last number is ratio of Heavy Duty/Resistance shield boosters. In this first example I use a total of 8 heavy duty shield cells. Surprisingly the best number of resistance boosters to have is just one when using thermal shields. If you mount two the effective shield strength is exactly the same, but the base shield points are lower. This makes you more vulnerable to plasma accelerators because they deal 60% absolute damage that ignores resistances entirely. On the other hand the bigger your base shield pool the longer they take to regenerate. As expected heavy duty shields are superior in all areas except for thermal resistance which is arguably the most important stat. The break-even point for reinforced shields is exactly the same as thermal resistance, 1 resist to 3 heavy duty. I repeated the test with kinetic resistant shields and got the same result. EDIT: I totally forgot to mention shield cells. Shield cells are basically batteries you can use to recharge your shield strength at any time, but in the process they generate huge amounts of heat. They also weigh a lot and consume vast amounts of power, so if you have multiple ones you may need to deactivate all but one. There are only two mods for shield cells. Rapid decreases the delay between when you press the button and when the cell discharges from 5 to just over 3 seconds, and it also shortens the time the cell is active from 5 to just over 4 seconds. This makes them more responsive and also helps to protect the cell from certain anti-shield cell weapons that only have an effect while the cell is discharging. However it also slightly decreases the total amount of shield points you receive, but by only 5%. The other mod is Specialized which increases power draw and decreases integrity by 15%, in return it reduces the thermal load by 24% and shortens boot up time by 32%. The drop in heat is the primary benefit because most ships are incapable of using a shield cell without damaging themselves. Only large ships like anacondas can use a cell without overheating. Even then sometimes you have to withdraw your hardpoints and bring the ship to a halt to reduce the existing heat load so that the cell won't push you over 100% heat. As for which is better, I would tend towards using rapid because it increases the chance that you can recharge your shield before it drains completely in a dangerous situation. If heat is your primary concern, or if you have more shield cells than you have heatsinks then specialized is superior. My current anaconda loadout has weapons that increase in damage the hotter I get so heat isn't a big issue for me and I try to ride the 101% heat line in order to maximize DPS. - Thermal resistance is the best shield mod because it offers balanced protection with no weaknesses. Reinforced is superior when defending specifically against plasma or kinetic attack. Enhanced low power is a worthless mod. Kinetic resistance is also worthless except for niche builds and for use on exploration ships that want to land on planets. - For serious combat always use the biggest A rated shield you can mount. For trading use the smallest A rated shield you can mount. For exploration use the smallest D rated shield you can mount. Hybrid mission running ships should try to strike a balance depending on how much cargo capacity you are willing to give up. - Prismatic shields are good for builds with lots of shield cells that fight single intense battles. Biweave shields are good for builds with few shield cells and high hull strength that fight long fights in RES and CZs. For multipurpose and non-combat ships regular shields work just fine. - If you are on a budget the largest D rated shield you can mount has the best protection/weight/price ratio. You can then upgrade to biweave later. D class and Biweave shields are FAR less expensive than A class and Prismatic. - Any ships that could possible see (or plans for) combat should have at least one resistance focused shield booster for maximum efficiency. ONLY one resistance booster should be used unless you plan to use more than 4 shield boosters in total. All shield boosters other than the first should be heavy duty instead. - When modding shield cells, use specialized shield cells if overall heat is a problem or you lack heatsinks. In all other cases use rapid shield cells for better responsiveness. - If you are on a budget or the largest D rated shield you can mount has the best protection/weight/price ratio. You can then upgrade to biweave later. D class and Biweave shields are FAR less expensive than A class and Prismatic. Added to the front page under combat. Awesome write-up Tamren! Oh neat, you should probably link the armour analysis I did a few pages back too. Did some pirate hunting around Rahu for the CG. Collecting escape pods is really awkward, either you play in solo where you have 5 pirates jump you the moment you pick up one. Or you play in group or open where there are 5 people in the same instance competing for a handful of pods and they kill so many bots that the pirates stop spawning. Also the rescue ships keep shooting down my missiles which is EXTREMELY annoying when trying to scoop pods and defend myself. I just boost up to within a couple hundred km, open the cargo doors, and I've got a class 3 limpet controller, so I target the pods and fire off a collector. All pips to shields, and, by the time the pirates start shooting, I've collected all five pods and I start firing back or just leave if it's not worth it. It's still annoying to have to jump in and out to collect (but those are always annoying), but, barring something like an Anaconda in a wing jumping in to hit me when I'm picking up the pods, I don't think anyone's going to get through my shields by the time I finish collecting. Just FYI the game launcher is buggy at the moment, if you hit the play button and nothing happens just wait a few minutes and the game should boot up. I think the beta was supposed to be today but isn't running yet? Other than that not much to report, the Rahu event is wrapping up today or tomorrow morning, at least the combat one. That illegal installation is wonderful for bounties, I wonder if there are any others in the bubble for federation or imperial systems, or if it's just something they added for the event. Also noticed something neat. I'm not sure when this changed but large beam lasers have two separate laser emitters placed side by side. It used to be that the laser beam would just appear out of thin air between the two barrels, but now it alternates between the two which gives it an oscillating appearance. I bet the huge version also does this but I haven't used one in months. I'm actually almost positive the large beams have always done that -- small and mediums have always been one emitter, but they thought it would be a cool little detail to have the large beam be two emitters that alternate in order to provide better heat efficiency. Yeah the engineering effects can get pretty funky. I have the "more damage from heat" mod on my plasma accelerator and it makes the plasma ball about twice as big and bright. These effects aren't really documented outside of youtube though, so it's not like you can recognize them to get a tactical advantage or anything. IIRC the engineering interface used to be different and it had pictures for stuff like this. Also it turns out refined focus crystals aren't as hard to find as I thought, you can get them from pirates but it's one of the rare drops along with proto light alloys and compound shielding. So you don't see them very often, but you generate so much salvage from fighting pirates you have many chances. I scooped up a bunch fighting in Rahu.